Lotus Temple Delhi is one of the most sought after places to visit, attracting tourists from all over the world. It is one of the seven major Bahai’s temples in the world. Located to the eastern side of Nehru Place, Bahai Temple Delhi was built in 1986 and since then it has been mesmerising visitors with its structural beauty and symbolism of oneness. The lush green landscapes around the main structure add further to its entrancing beauty. Built by the architect Fariburz Sabha, Lotus Temple presents a breathtaking structure with deep significance. In contrary to other religious places and shrines, Lotus Temple is not dedicated to one deity; it is place which emphasises more on unity, peace, meditation and togetherness among people of different countries, race and religion. Also known as Bahai house of worship, this temple is open to people of all religions. The use of Lotus flower also symbolises the same, the lotus flower is commonly used in many religions such as Hinduism, Buddhism, Jainism, Islam and others. It has been recognized and appreciated throughout the world. With more than 10000 visitors daily Lotus Mahal Delhi is undoubtedly one of the most visited tourist attractions in India. Delhi Kamal Temple was built by the Iranian architect Fariborz Sahba, who won many awards for this architectural masterpiece. As the name suggests, it is in the shape of a lotus flower. It is one of the six major Baha'i houses of worship; rest of six are in Sydney (Australia), Panama City (Panama), Wilmette (USA), Apia (Western Samoa), Frankfurt (Germany) and Kampala (Uganda). Built with marble, the temple is in the shape of a half opened lotus with 27 petals. The intricate design of the temple showcasing the everlasting charm of a lotus is an example of architectural brilliance. Lotus flowering building was built in the said shape as the lotus flower is connected with various other major religions of the world, hence representing oneness and harmony. Lotus temple construction took around 10 years of time for completion. Along with the chief architect, there was a team of around 800 engineers, technicians, artisans and workers who took part in the creation of Lotus Temple Delhi. A lot of hard work has also gone into making this captivating temple. For instance, petals of the lotus flower were covered in a continuous work of 48 hours; this was done to avoid construction joints. The structure of Lotus Temple Delhi has primarily three layers of nine petals. Each rank of nine petals is raised on a podium which further elevates the building. Out of the three levels, first two are built in inward curve which appear to be covering the inner dome while the third rank is curved in the outward direction, creating a shed kind of covering over nine entrances. As the geometry of the Lotus temple design consists of no straight line, the construction of the structure with intricate double curved surfaces was nothing less than a challenge for the architect, technicians and everyone involved. The petals have been built of reinforced white concrete cast, clad with white marble panels. To avoid rust stains on the white concrete, the shells of the lotus petals have been galvanized. There are nine arches that offer support to the ring of central hall. The Lotus flower is half open, hence makes a way for the natural light to enter the auditorium of the Lotus Mahal Delhi. There is a roof of glass and steel that provide protection from rain and dust while allowing light to pass through. Spread over 26 acres of land, Lotus Temple Delhi comprises of a few parts, the main building, which is the centre of the worship, an administrative building and a library, a reception centre, restrooms, etc. The main assembly area of the temple is in the shape of lotus flower. The entire structure is made up of white marble, which further adds to its hypnotizing beauty. The marble used in constructing the temple was brought from Penteli Mountain in Greece; it is said that all the prominent Bahai house of worship are built with the same marble. The Inside lotus Temple consists of a central hall of the Bahai temple Delhi that is around 40 meter tall with a whopping capacity of accommodating around 2500 people. There are nine entrances to this hall. All the nine entrances are surrounded by gardens and ponds which present a captivating sight. The temple in the shape of lotus flower appears to be floating in a wide spread of water. Another attractive feature of Lotus temple Delhi is that it is the first temple in entire Delhi to start using solar power. It takes around one – two hours for exploring this beautiful temple and spending some time amid its spiritual stillness. Lotus Temple Timings are from 9 AM to 7 PM in summer season. During winter visiting timings are from 9 AM to 5:30 PM. Kamal Temple is open on all days of the week except Monday. There is no entry fee for Lotus Temple. However, if you are planning to take photographs, a special permission is required. Lotus Temple, also known as Bahai Temple, is a prominent landmark in Delhi hence it can be easily reached via public transport. The best mode of public transport for Bahai Temple is via metro trains. The nearest metro railway station is the Kalkaji Mandir metro station. From here, you can hire an auto rickshaw to the temple. If interested, tourists can also hire a private taxi and travel in a hassle-free way. Lotus Temple Delhi was built in 1986 by the Iranian architect Fariborz Sahba. Lotus Temple History is associated to the teachings of Bahai faith. Lotus temple religion can also be traced back to Baha'i faith. According to Baha'i religion, humanity binds everyone together. It works on the belief that everyone must break the barrier of caste, race, creed, nations to come together in creating a world of togetherness. It believes in the concept of oneness of mankind, religion and one God. The lotus flower design has also been used in keeping the belief of Bahai faith into consideration. For instance, lotus flower is symbolic of purity and oneness. It symbolises aspects of life-preservation and procreation. The lotus flower has been used to indicate unification of every religion. In Baha'i house of worship also there is use of the lotus flower but the emphasis is on light and water as they are believed to be the two most prominent elements. Lotus flower plays an important part in almost all the important religions of the country. For instance, in Hindu religion, lotus flower is used to represent purity and divine love. It is sacred flower that is said to have come out of Lord Vishnu‘s navel during meditation. It is the holy flower where Lord Brahma sits. It has been associated with worship among Hindu since the Vedic times. In Buddhist religion, Bodhisattva Avalokitesvara is said to have born from a lotus flower and is shown sitting on a lotus flower. It has high significance in Buddhism as in his teaching even Lord Buddha has his disciples to be like a lotus flower, to bloom with purity even amid dirt. The symbol of lotus flower can be seen in Zoroastrian architecture as well as in Persian designs. The symbol of lotus has been widely used all over the world for various purposes which are one of the reasons behind the architecture of Lotus flower temple. Kalkaji Devi Temple – The most sought after place to visit near Lotus Temple is the Kalkaji Devi Temple. One of the most popular temples not only in Delhi but in entire North India, Kalkaji Devi Temple is dedicated to Goddess Kali in the form of Goddess Kalka who was incarnated to kill the demon Raktabija. It is located opposite to the Nehru Place business centre. According to legend, the image of Goddess Kalka is self-manifested. It is believed that this temple dates back to Satya Yuga of Hindu religion. According to legends, Pandavas, and Kauravas have worshipped the Goddess here in this temple. As per the findings, some parts of the temple can be traced to 1764 AD and was built by the Maratha Rulers. Devotees come and visit this temple from all parts of the country, especially during the festival of Navaratri. Kalkaji District Park – Another place to visit near Bahai Temple is the Kalkaji District Park. A popular hangout place among locals, this park is a good place to relax after your visit to other sightseeing places. Its captivating terraced gardens and lush greenery offer a refreshing break from the concrete jungle of the city. It is popular venue for the Navratri festival as well. ISKCON Temple- Located at Hare Krishna Hills, ISKCON (International Society for Krishna Consciousness) Temple in Delhi was opened in 1988. Designed by Achyut Kanvinde, Iskcon Temple Delhi is one of the biggest temple complexes in India. Presenting a captivating architecture, this temple not only attracts devotees but also architecture lovers. ISKCON Temple is adorned with breathtaking interiors depicting instances from various religious epics while holy chanting create peaceful and spiritual atmosphere. ISKCON Temple of Delhi also focuses on educating people about lord Krishna and his teachings. It is also known as Sri Sri Radha Parthasarathi Mandir as Lord Krishna and Goddess Radharani are present in the form of Radha Parthasarathi here. Where is Lotus Temple Located in Delhi, India? Lotus Temple location is near the Nehru Place. It is located towards the east of Nehru Place. It is quite close to the Kalkaji Devi Temple. The nearest metro station to lotus temple is Kalkaji Mandir. Lotus Temple is near the Nehru Place. It can be reached via Kalkaji Mandir metro station which is close by. It is also close to the another landmark of Delhi - Kalkaji Devi Temple. Who Built Lotus Temple in Delhi? Lotus Temple in Delhi was built by an Iranian architect named Mr. Fariborz Sahba who won many awards from all over the word, recognizing this excellent architecture. The Lotus Temple is one of the seven major Baha'i houses of worship. Baha'i faith teaches oneness and togetherness among everyone irrespective of caste, creed or religion. Although known as temple, there are no pictures or images of God or Goddess in Lotus Temple. When was the Lotus Temple Built? Bahai Temple in Delhi was built in the year 1986. Bahai Temple, also known as Lotus Temple is a house of worship of Baha'i faith. It is one among the seven prominent Baha'i houses of worship in the world. Who is the founder of Lotus Temple? 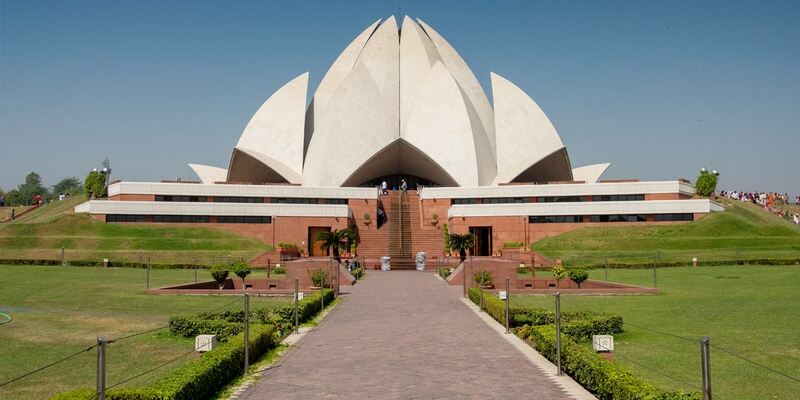 Founder of Lotus Temple is Architect Fariborz Sahba, who completed the construction in 1986. Lotus Temple has been built in accordance to the Baha'i house of worship specifications which were given by Abdu'l-Bahái, son of the founder of Baha'i Faith. Why was Lotus Temple Built? Lotus Temple was built as a symbol of unity and purity which Baha'i faith teaches. It was built as one of the Baha'i centre of worship in India. There are another six centres which are located all over the world. Before building lotus temple, architect Fariborz Sahba had travelled extensively all over the country, understanding the temple structures and usage of various religious symbols, who then used the symbol of Lotus flower to represent unity and peace.